Three months ago, OnTrack WNC launched our new website. Not only is the website more versatile, visually engaging, and offers easier navigation, but it also has the ability for people to register online for classes. That’s right, now community members are only a few clicks away from registering for any of our in-person classes. 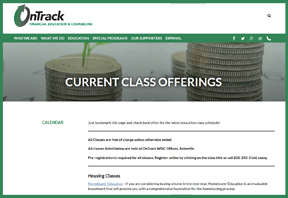 Now, when referring a friend, colleague, or client to one of our classes, you can send them the sign up link. Check out an example here.